Gov. Wolf delivers his budget address at the state Capitol in Harrisburg Tuesday. Gov. Wolf on Tuesday presented his proposed budget for the fiscal year that starts July 1. In his speech Wolf, a Democrat, pitched the Republican-controlled General Assembly on a nearly $33 billion spending plan that includes more money for public education, a tax on natural gas drillers, and a boost in the state's minimum wage to $12 per hour. That used to be the opening gambit, the precursor to the compromise. But now, that's all we're going to get. That's not just because of partisan politics. This is an election year, which means the budget becomes even more of a political chess piece rather than a statement of policy priorities. June 30 marks the deadline for the new budget. But more and more, that day just marks the start of the blame game, as the governor and legislative leaders chastise each other for once again failing to do their jobs. Wolf and the General Assembly missed the 2017 deadline to finalize the budget. The details of the spending plan, Wolf's third since being elected, were not finalized until late October, four months late. Wolf's first and second budgets were likewise mired in obstinacy and plagued by delay. The politics for his fourth try portend even more trouble. Wolf is seeking a second term. Two of the Republicans seeking their party's nomination to challenge him, state House Speaker Mike Turzai and State Sen. Scott Wagner, have every reason to stymie Wolf. Another year of intractable budget bickering would be a potent political narrative to hit Wolf with. 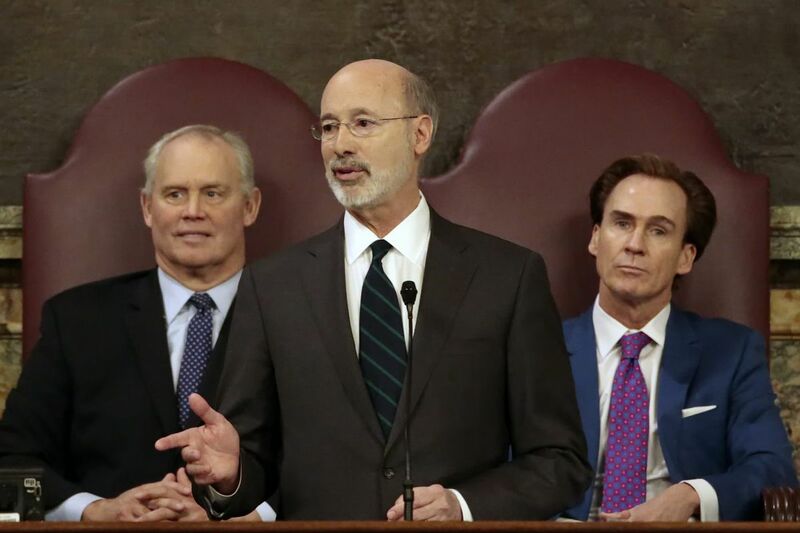 Wagner knocked Wolf for his past budget travails, including the increased taxes to cover spending plans pushed on the governor by Wagner's fellow Republicans. Turzai dismissed Wolf's ideas, saying his colleagues are "not interested in more job-crushing taxes." The other Republican gubernatorial candidates, Paul Mango and Laura Ellsworth, also piled on, particularly incensed that Wolf proposed a natural gas tax. One of these candidates will win the May 15 Republican primary. It's hard to imagine a time before then, or after then, when they will urge Republicans to work with Wolf to develop a sensible spending plan. It's also hard to imagine Wolf setting aside his ambition for that second term to deal with Republicans, especially knowing how his first three tries went. This is where we find ourselves. We can't stay here. Too much is at risk. Pennsylvania ranked 42nd in unemployment as of December, according to the U.S. Bureau of Labor Statistics and trails other states in job creation, according to the U.S. Census. Wolf and the General Assembly should spend all — if necessary — of the next four months and 22 days working together to find a compromise so they can pass a budget by June 30. He and his potential challengers are all campaigning on issues like job creation, education and the economy. That all starts with the state budget. Stop treating the budget like a game and do the job.